Volunteerism is one of the most important activities Back Country Horsemen can use in our effort to perpetuate enjoyable common sense use of pack and saddle stock in the backcountry. A central point of our mission statement is to assist government agencies in maintenance and management of public lands. By using our time and resources, we help insure that public land remains open to recreational stock use by earning a seat at the table where we can influence the decisions concerning access to public lands by pack and saddle stock users. The value of being able to speak with public lands managers from the position of having provided volunteer service cannot be overstated. The hours and value of volunteer service by Back Country Horsemen is consistently underreported. It seems that while our members are more than willing to volunteer their time and energy to maintain trails all across the country, many are reluctant to report the hours and expenses incurred in that effort. It is important to understand that the value of the volunteer service goes beyond trail work hours. It also includes time members devote to engagement in the management planning process. Other reported expenses like travel time, stock use, stock and equipment hauling, and in-kind donations add to the value of our volunteer service. The 21 year total of BCHA volunteer service of $139,805,692 million is a value that gives BCHA national representatives significant leverage when engaging with the Public Land management agencies and other user groups in policy discussions about trail access and maintenance. It is much harder for trails to be closed to pack and saddle stock use when we are providing a large portion of the effort to keep them open. Even when members report their basic work hours on projects, they often fail to report the associated contributions like the travel time, mileage, and stock use. Each of these categories adds considerable value to the volunteer effort of the individual member. It does not include private lands such as private timberlands unless they will eventually become public lands. Planning and hosting clinics which provide education. Travel time is the time spent getting to a project and back. All participants on the project can report this time. The driver should report his mileage as well. Report as stock hauling vehicle mileage if you are pulling a loaded trailer. Volunteers should report hours spent riding a trail in preparation for a trail project as Recon hours. These are the hours needed for the project planners to determine the resources and level of effort required to successfully undertake a project. Always report all pack and saddle stock use. This is a valuable contribution by volunteers. Remember that using an animal for any part of a day constitutes a Stock Day even if it is only used for a short period. Report the time members spend participating in planning meetings with public land agencies as well as the travel time getting to them. Report the time preparing and presenting educational events. 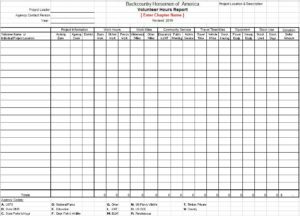 Locally, each chapter should be reporting their hours into the land managers in the Fall on the land manager’s time schedule. Ideally, within BCH the hours should go to somebody identified in the state or affiliate to collect these hours, but if no one has been identified, then the National Director is ultimately responsible for getting these hours to the National Board of BCHA.